A 'Wisdom Keeper' Draws From A Deep Well Of Navajo Culture : NPR Ed In the Navajo culture, teachers are revered and trusted. 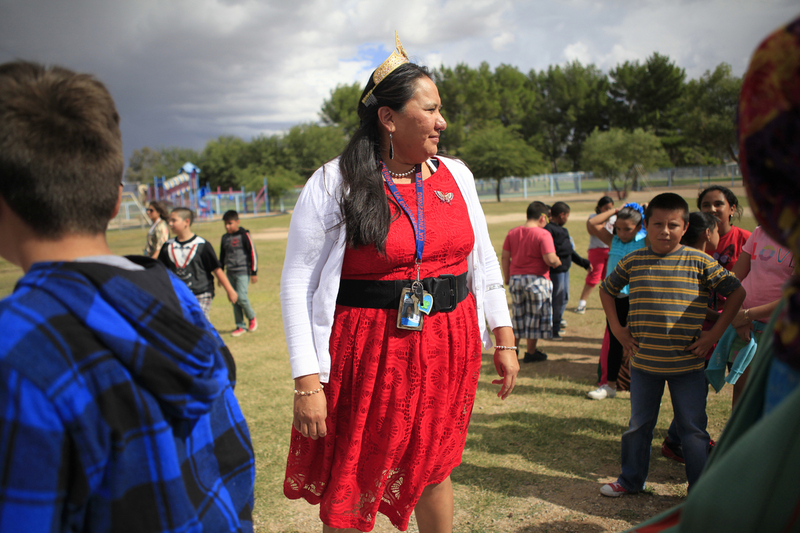 Tia Tsosie Begay is no exception, making sure her fourth-graders know that "someone believes in them." 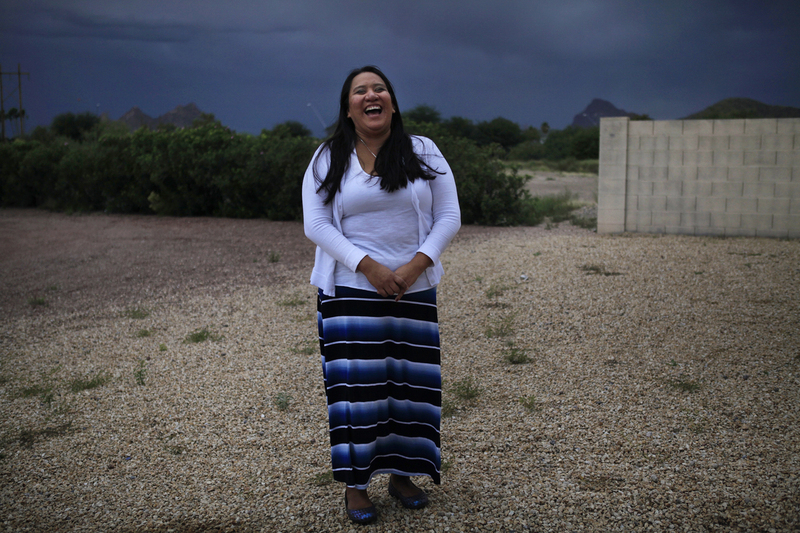 Tia Tsosie Begay is a fourth-grade teacher at a small public school on the outskirts of Tucson, Ariz. 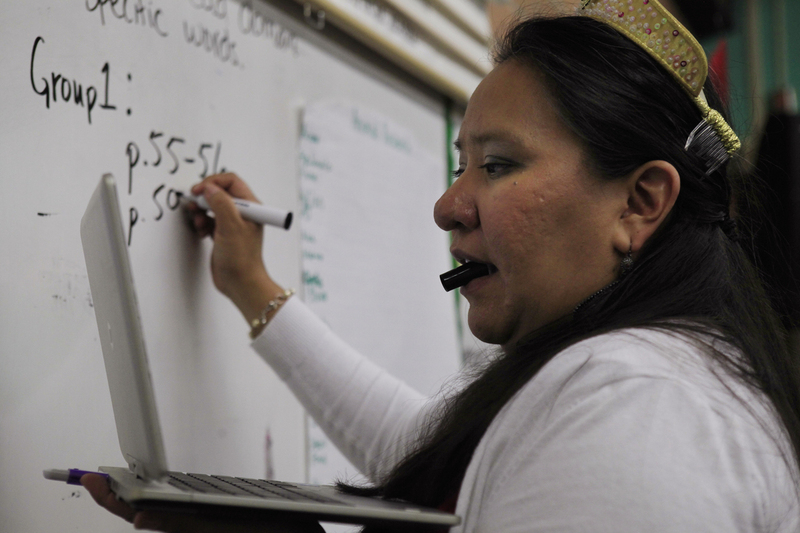 In the Navajo culture, teachers are revered as "wisdom keepers," entrusted with the young to help them grow and learn. This is how Tia Tsosie Begay approaches her work as a fourth-grade teacher at a small public school on the outskirts of Tucson, Ariz.
For Navajos, says Begay, your identity is not just a name; it ties you to your ancestors, which in turn defines you as a person. "My maternal clan is 'water's edge'; my paternal clan is 'water flows together,' " she explains. "Our healing power is through humor and laughter, and I try to bring that to my classroom." The day we first meet, Begay is wearing a smile ear-to-ear and a plastic toy crown. It's "King and Queen Day" at Los Ninos Elementary. The school serves mostly Mexican-American and Native American — Yaqui and Tohono O'odham — families, as well as a few children from Somalia. This morning, though, Begay is worried. The parent she's been trying to meet with is a no-show, again. Begay desperately needs to talk to her about her little boy. He's a smart child, "but right now, he's about a year behind," she says. "When I first met him, he was two years behind." She suspects there are problems at home that are keeping him from doing well in school. He's always late and has already missed too much school. 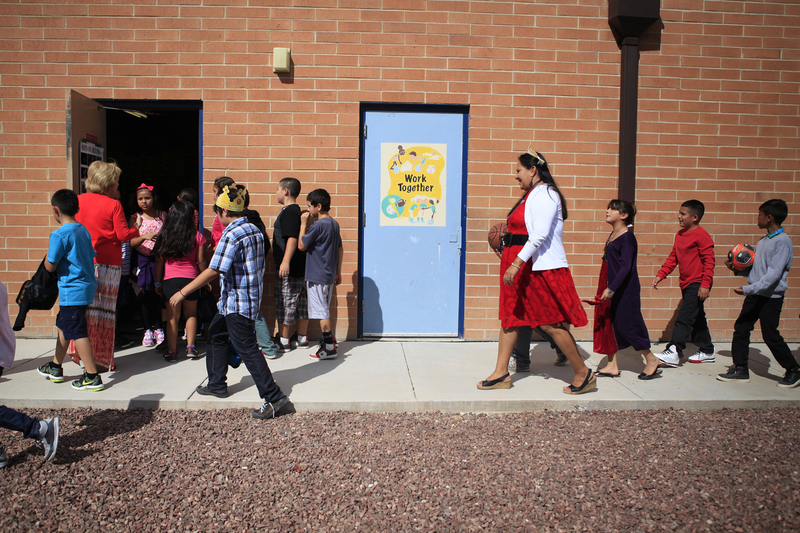 By 8 a.m., kids are arriving, and Begay's classroom quickly becomes a beehive of activity. It's cluttered, but in a good way. Bookcases overflow with fiction and nonfiction books. One shelf is set aside for books about Komodo dragons, slugs and stink bugs, and a class favorite titled Why Do Animals Do That? 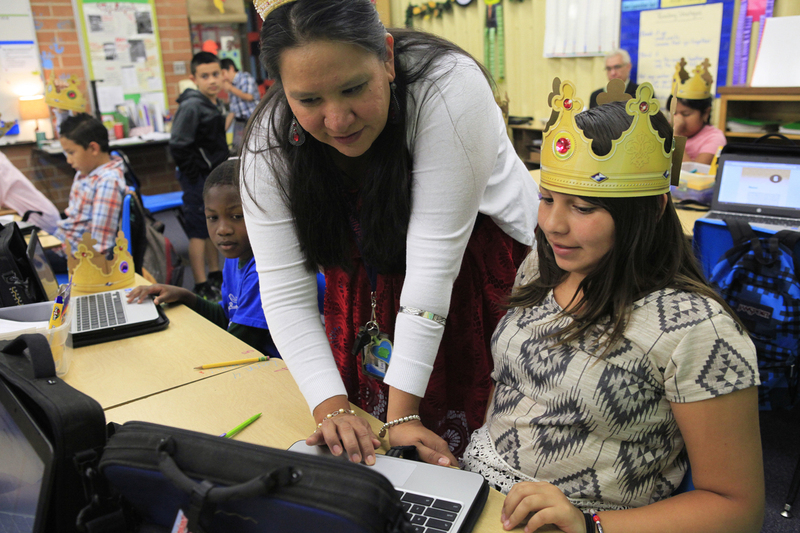 On "King and Queen Day," the whole class wears gold paper crowns. Forty-five minutes into the class, the little boy Begay is so worried about finally walks in, shoulders slumped, head bowed. Rather than embarrassing him in front of the class, Begay welcomes him warmly. "He already feels [down]," she tells me. "He transitions quicker if I just say, 'I'm glad you're here.' "
Of the 25 children in her class, this particular boy is the one who's testing Begay's long-held conviction that no child is a lost cause, no matter how troubled he seems. 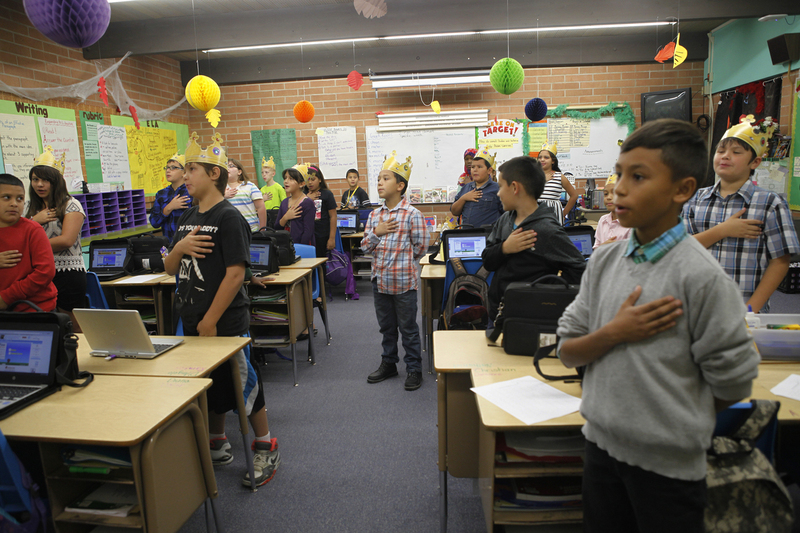 It's the unspoken pledge teachers start out with, says Begay. "When you go into teaching, you go in starry-eyed." Back then, she says, she told herself, "Oh, I'm going to make a difference, do amazing things, light their fire. Then you realize, [your] kids are two years below grade level and time is passing you by." Teaching was not Begay's first calling. When she left the Navajo reservation in northeastern Arizona where she grew up, she thought about going to law school, or studying linguistics. She even considered politics, but none of it felt right. While still in college, Begay started mentoring kids. She thought she could give teaching a shot. In the Navajo culture, teachers are called "wisdom keepers." They're revered and entrusted with the young. After earning her master's degree in education from the University of Arizona, Begay got married. She had two children, taught for six years, then spent another five training other teachers. Now, at 35, she's doing what she loves most: watching the proverbial light bulb go on in her students' heads. Like this morning, when one of her kids who has struggled with English blurted out, "We need textual evidence!" Students file back to class after a music special. "I was very excited about that," says Begay. "I got goose bumps." Begay wraps up the math, reading and writing exercises that have taken up most of the morning. It's noon, time for lunch and the raucous pizza chant: "With a pizza in my hand, I'm gonna be the pizza man." The kids love it. During lunch I sit down with Begay's students and ask them what they like about her. "She never gets angry," says one girl. A boy adds: "She's funny and likes telling jokes, like the one she told the other day. 'What do ghosts like to eat? Sbooghetti.' "
Everyone laughs. I wince. Before we leave the table, the shy, quiet girl who's been sitting next to me says almost in a whisper, "She teaches me when I don't want to learn." Begay is doing what she loves most: watching the proverbial light bulb go on in students' heads. Her comment stays with me. Later, when I share it with Begay, I tell her that I felt it was a very profound thing for a child to say. She agrees. "They don't verbalize that to me," says Begay. "But that's what I strive for. I want them to enjoy school. I want them to feel like someone believes in them." After lunch, Begay dismisses her students. Today is a half-day, and teachers at Los Ninos Elementary have all scheduled parent-teacher conferences for the rest of the afternoon. Begay walks her kids outside to dismiss them, but as they scatter, she realizes she forgot to hold on to that troubled boy in her class. She had planned to walk with him to meet his mom on the pedestrian bridge he crosses to get to school. But he's gone. In the distance, she spots him in his little blue vest and paper crown, walking with his mother. Begay is really upset with herself. She knows this little boy needs help. Los Ninos Elementary serves mostly Mexican-American and Native American families, as well as a few Somali students. "Based on what I know about the family," she says, "within two to three years he's going to drop out of school." "Why would anybody allow that to happen, to have a child fail?" I ask. "I hope nobody would," she responds. 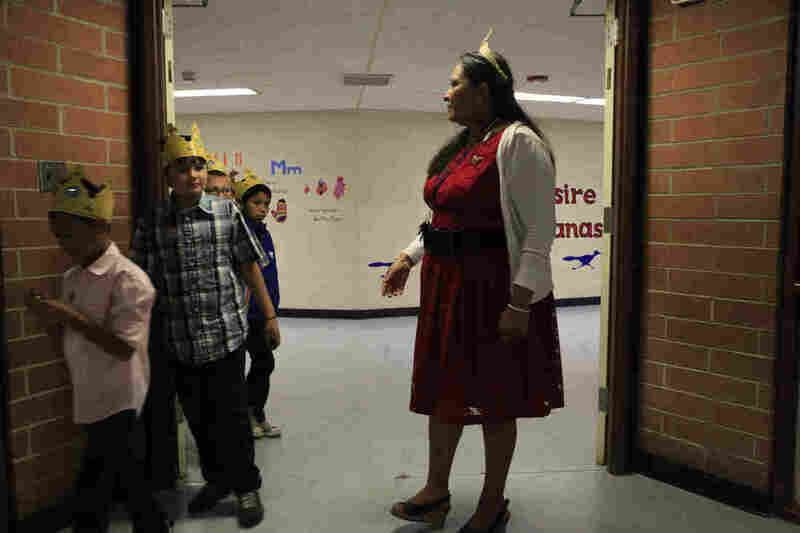 "I want them to say, 'At least one person, Miss Begay, is there every day for me. Miss Begay is going to wonder where I am if I go missing. There will be one person looking out for me, and it's Miss Begay.' "
As we walk back to her classroom, Begay wipes away her tears and says she'll be back tomorrow to try again. And if necessary, she'll be there the next day, and the next, and the next.